Julia Peirone is a shooting star amidst Scandinavia’s constellation of photographers. Her work is simultaneously fresh and sophisticated – it speaks the language of innocence combined with the insight of experience. She adds and subtracts her subjects, deconstructing and rebuilding reality. In blackness, a girl blows bubbles, with only yellow highway lines to indicate location. 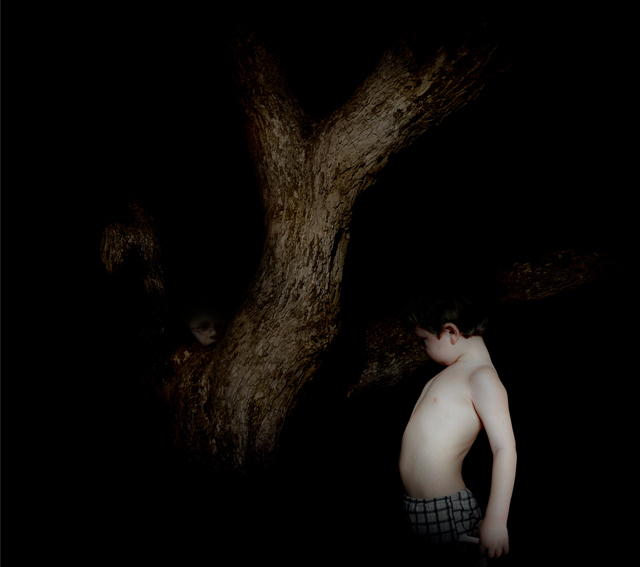 A young boy arches his white back near the bend of a tree, surrounded in darkness. These are oddly emotional images with beautiful composition, crafted by an expert eye. One of her more recent projects is titled Northern Lights. The Nordic Photography Centre in Oulu, Finland, chose Peirone to work with a team of photographers to document life in six different northern cities. The purpose of the project was to interpret urban reality and dispel the myth that the northernmost edge of the continent is all Laplanders and reindeer. Peirone and a small group of selected photographers travelled from Murmansk, Russia to Reykjavik, Iceland to Oulu, Finland, amongst other cities, for a year and a half, photographing what they experienced. 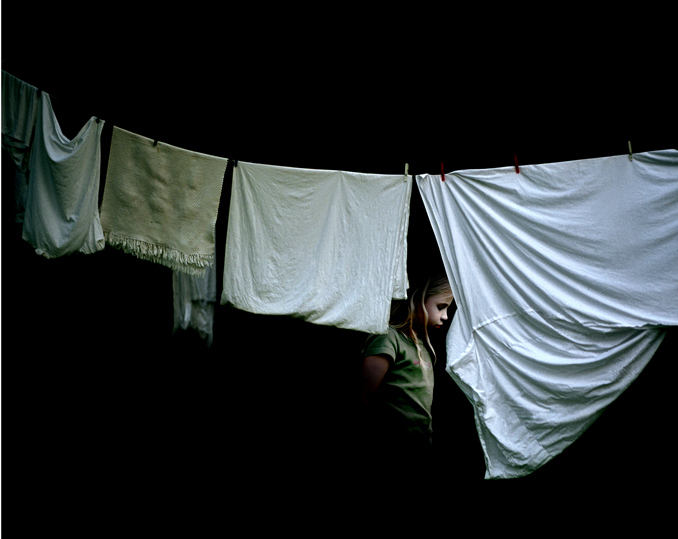 One of the most compelling images from Peirone’s Northern Cities series is Girl Behind Window. A pretty girl, outside and dressed for the cold, breathes from behind a windowpane – you can see her breath against the glass. She looks dreamy and faraway, framed by plants in the windowsill. As viewer, we can feel both the inside and out. The interior speaks of the human effort to create an inviting space – the plants are well cared for in spite of the freezing temperatures outside. The girl is on the cusp of two worlds – we see her from the warmth of indoors, but she is still a part of the cold, physically-intense world outdoors, presumably on her way inside to take refuge from the cold. The scene reminds the viewer of that sudden transfer from outside to in, the quickness with which one can cross boundaries, change one’s reality. Peirone recalls the context of that photo, what she was doing and thinking about at the time: “I remember in Haparanda, there were no people on the streets. I just saw a lot of houses where people were indoors, looking out from inside. I got this claustrophobic feeling about this emptiness in the town. That feeling in some way inspires Girl Behind Window. But I was also inspired by the feeling I got from a lot of the Russian girls I met, and the passion and desire they have to get out from their home and environment. The dream of something better outside was a very strong feeling throughout the trip, especially in the Russian cities. Maybe the girl in the photo desires something – just wanting to breathe. While working on Northern Cities, Peirone began her Night Spot series – she said that it was a response to her need to be free from colours. Night Spots is aptly named in that we see only spots of life – a girl and a pelargonium, for example, or a girl with a ladder. But the rest of the scene is black. The darkness is not menacing, necessarily – it serves as a powerful contrast to the lightness, both literally and thematically, of the subjects it surrounds. The images have a surreal dream-like quality, so it is fitting that they be surrounding by the blackness of a deep sleep. Peirone uses an analog medium format camera and then scans her images to create computerised montages. It is her way of playing with pieces of reality. Like the girl blowing bubbles, she gets lost in the act of inventing her own truth, controlling and bringing meaning to her world. Simultaneously, however, she is aware that she has no control, but is simply and intuitively moving through her world, picking up pieces as they come to her – like a smart young girl interpreting a new foreign country.